Cardiff City chairman Mehmet Dalman says manager Neil Warnock will receive the backing he needs to mount a promotion bid in 2017-18. 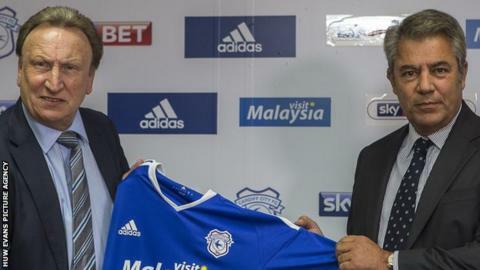 Warnock, 68, has signed a one-year extension to remain with the Championship club. Dalman said Warnock had the full support of club owner Vincent Tan and the manager would be backed in a push for promotion to the Premier League. "We want to him to have a go. We want to have a go," Dalman said. "We had very extensive discussions over what his needs are. "We've agreed on all of them and I think he needs to get off the block pretty quickly in getting his team together for next season. "We always want promotion - every season we say that. "The real wonderful situation for us here, and I don't think people appreciate, is that Neil has his own agenda on getting promotion. "That plays into our hands very well. We have somebody who has ambitions beyond being a manager and that's fantastic news for us. Cardiff were in the Championship relegation zone when Warnock took over, but have moved up to 12th after three successive wins. The former Leeds, QPR and Crystal Palace boss had been seeking assurances over the club's transfer policy before committing to a new deal. Dalman said the club's Malaysian-based owner Tan did not need any convincing about retaining Warnock for for the 2017-18 season. "He watches every game, he doesn't need any convincing," Dalman told BBC Wales Sport. "We all make decisions on a rational basis. You look at the results, you look at the atmosphere, look at the togetherness and you look at the attendances. "Neil addressed all those things all in one go so Vincent would never have doubts about supporting someone like Neil. "Because he's incentivised by his own motives all we have to do is give him the platform and the environment to achieve that." Dalman said Warnock has brought "togetherness" to the Championship club since replacing Paul Trollope in October 2016. "We love Neil to bits, both on a personal and professional basis. He's good for us and long may it last," Dalman said. "He's won the management over, certainly the owner and the board. He communicates extremely well with the fans and most importantly with the players. "Getting Neil on board there was no hesitation and renewing his contract was the same."